A cardinal (Latin: sanctae romanae ecclesiae cardinalis, literally cardinal of the Holy Roman Church) is a senior ecclesiastical leader, an ecclesiastical prince, and usually (now always for those created when still within the voting age-range) an ordained bishop of the Roman Catholic Church. The cardinals of the Church are collectively known as the College of Cardinals. The duties of the cardinals include attending the meetings of the College and making themselves available individually or in groups to the Pope as requested. Most have additional duties, such as leading a diocese or archdiocese or managing a department of the Roman Curia. A cardinal's primary duty is electing the pope when the see becomes vacant. During the sede vacante (the period between a pope's death or resignation and the election of his successor), the day-to-day governance of the Holy See is in the hands of the College of Cardinals. The right to enter the conclave of cardinals where the pope is elected is limited to those who have not reached the age of 80 years by the day the vacancy occurs. 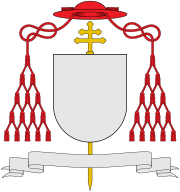 The term cardinal at one time applied to any priest permanently assigned or incardinated to a church,<ref name="CE-cardinal"></ref> or specifically to the senior priest of an important church, based on the Latin cardo (hinge), meaning "principal" or "chief". The term was applied in this sense as early as the ninth century to the priests of the tituli (parishes) of the diocese of Rome.<ref name="CE-cardinal" /> The Church of England retains an instance of this origin of the title, which is held by the two senior members of the College of Minor Canons of St Paul's Cathedral.